After weaving many yards fabric, all my preconceived ideas of color, texture and material began to fall away and I started to make connections with textiles that inhabit a sense of depth. The woven fabric began to function less as pattern and began instead to serve embroidered motifs, in the foreground, increasing the levels of distance and space. I started to discover ways of embellishing the surfaces with asymmetrical lines and non-linear ways of marking on the cloth. The process of using the handwoven cloth as a kind of “found” canvas is what moved this series of 10 wall pieces into a discovery of the duality of the woven surface. 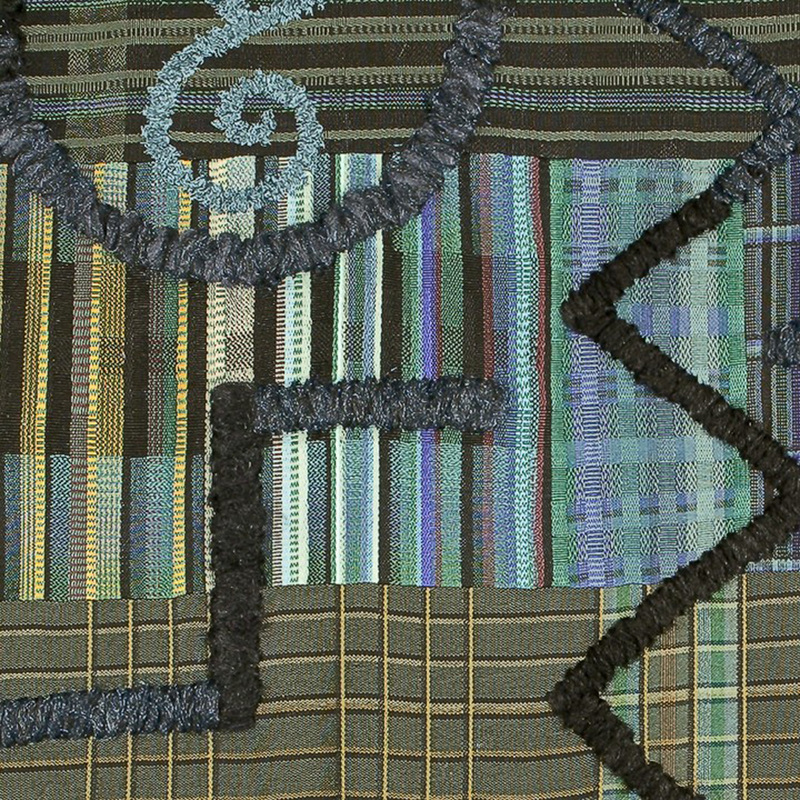 Handwoven silk and cotton fabric, sewn, pieced and embroidered with mohair, silk yarn and hand-dyed silk ribbon. This wall piece was inspired by the calming and ecstatic images of water and an Emily Dickinson poem. Inspired by the short story “The Story of a Shipwrecked Sailor” by Gabriel Garcia Marquez. I wanted to create the balance of possibility and fatalism which I was feeling as well as the theme in his writing. I wanted to make a kind of royal cloth. A Purple cloth being the choice of kings and used in times of great devotion and religious processions. This piece is titled “ Kili Watch” after the song by Johnny Hallyday . I wanted to create the frantic and amazing French Rock n’ Roll song frenzy, texture and swirl. Part of a series dedicated to the French singer, actor and idol Johnny Hallyday, especially his music and persona from the early Rock n’ Roll and ye`ye` era. This piece could be subtitled “Serre la main fou” (Shake the hand of the fool) after one of his hit songs. The Red Zeus. Zeus’s blood. What game is Zeus playing?